Share Documents Online and Avoid in-person Check-in. Avoid carry paper documents and attend in-person tournament registration check-ins or email files to the organizer. The whole process can be done online with a few clicks. 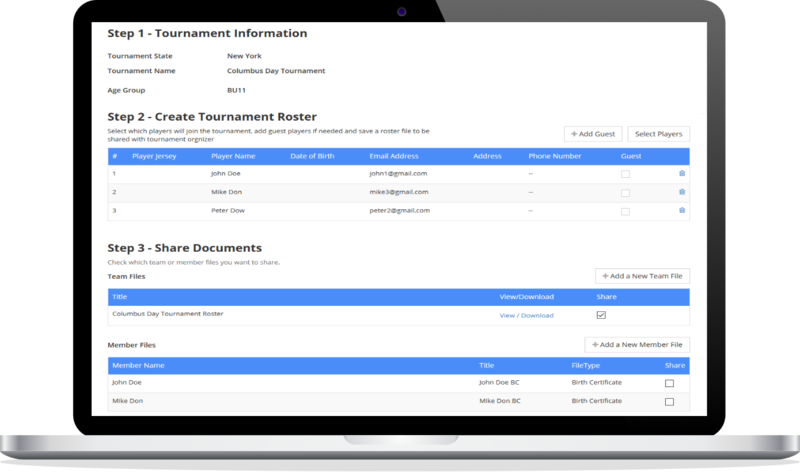 Upload member birth certificates, medical release forms and other documents ONCE and use for many tournaments. Submit registration documents for tournaments in seconds. Select a tournament from a list of affiliated organizers, submit rosters, team and member files directly from TeamTracky. No more creating roster spreadsheets or printing member forms. All documents are securely stored on our servers. Only affiliated tournament organizers can see the shared files until the day after the tournament.